In early March 1969 a new group of sailors arrived in-country to relieve Navy Mobile Riverine Force personnel who were finishing their tours. Men were spread out throughout the four River Assault Squadrons in the III and IV Corps regions of South Vietnam. President Nixon’s “Vietnamization” program was accelerating at an increased pace. The new crewmen were distributed from an attrition pool and began combat operations from the onset. Their long and intense training was being put to use soon after graduation from the Naval Inshore Operations Training Center (NIOTC) at the Mare Island Naval Shipyard in Vallejo, California. On March 31, 1969 several riverine craft began an operation just south of Ben Tre in Kien Hoa Province. All was going well until the column began transiting the Giao Hoa Canal. In a flash the Viet Cong launched an intense ambush striking several boats. Radioman Seaman H. “Bruce” McIver was wounded by shrapnel from a Viet Cong B-40 rocket that struck his T-131-7 boat during the initial enemy onslaught. The concussion from the rocket blew McIver against the forward ramp, also injuring his back. Shrapnel also ignited a gasoline fire in the welldeck. 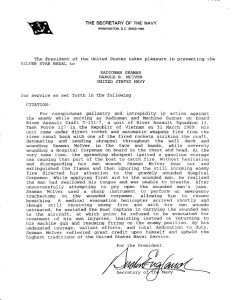 Noting the Hospital Corpsman, who was riding the boat for the operation, was also seriously wounded, Seaman McIver instantly prioritized his options. He rushed to the fire and worked on it until it was suppressed. Then he quickly moved over to attend to the serious wounds the corpsman. Realizing the corpsman’s life was in grave danger due to head and chest wounds, McIver performed an emergency tracheotomy. Once the corpsman was breathing again and somewhat stable, Radioman McIver helped his Boat Captain, BM1 Thibadeau, with loading him onto a medevac helicopter. He refused to be medevaced and returned to his machine gun to aid in suppressing the ongoing Viet Cong ambush. During the next couple of days Thibadeau began the process of putting McIver in for the Silver Star Medal for his heroic actions. Somewhere along the line the recommendation was lost or not followed up on. Thirty some years passed before Bruce and John found one another in 2003 after many years of searching. Soon after John contacted the Chief of Naval Operations and the Secretary of the Navy regarding the Silver Star award. The paperwork was re-initiated via the Chief of Naval Operations office. During those thirty some years Bruce just knew the corpsman as “Doc” since he was serving temporary duty on T-131-7 when he was seriously wounded. This nagged at Bruce because he had no idea whether the corpsman had survived or not due to the seriousness of his wounds. That evening Bruce checked the phonebook and made his first call. Much to his surprise Zeph’s mother answered. She had bittersweet news for Bruce. Zeph had indeed made it through his serious wounds after medical stops in Dong Tam, Long Binh, Yokosuka, Japan and finally Bethesda Naval Hospital in Maryland. So much so that he had become a doctor and private pilot. In 1971 Zeph had traveled back to Vietnam to help build a medical clinic close to where he had been wounded. This was the good news. The bad news was that Zeph’s personal plane crashed in 1985 with the loss of his life and a relative who was a passenger. Zeph’s sister-in-law made the comment that Zeph “lived on the edge” all of the time. We who have served can understand well. During the process Bruce found out that his own children were born around the same time as Zeph’s two daughters, Jamie and Kim. He has been in touch with the family and much “closure” has come about for all involved. Jamie has been communicating with Bruce in an attempt to find out all she can about her father’s service. On July 2, 2004 Bruce received a telephone call from Commander Leslie Priest, a representative the Secretary of the Navy. 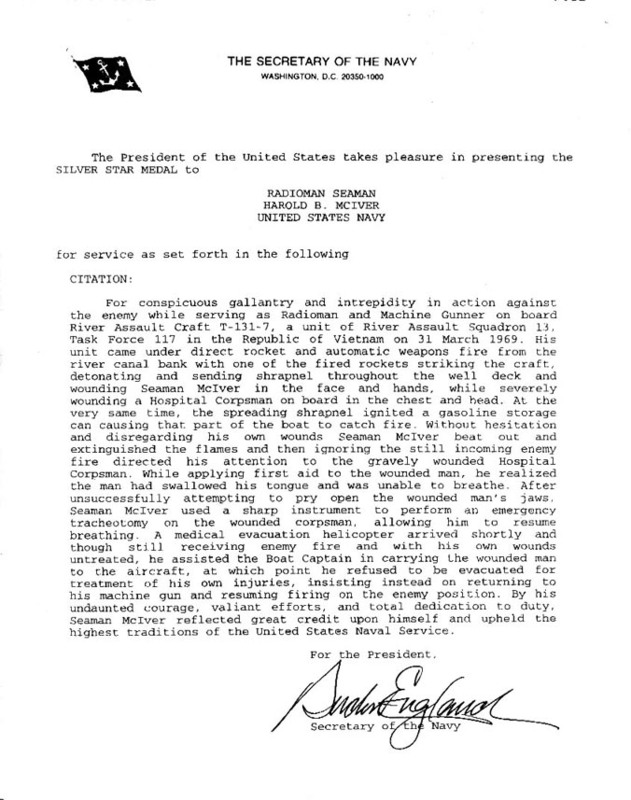 He was informed that the Secretary, on behalf of the President of the United States, had approved the award for the Silver Star Medal thirty four years after his heroic actions to save his fellow sailor and his boat that day. 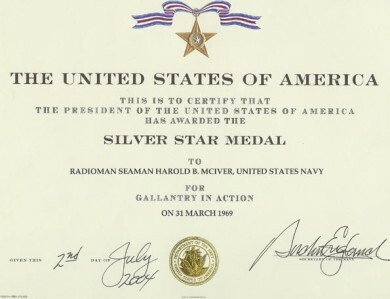 The award is for “conspicuous gallantry and intrepidity against the enemy.” The Secretary of the Navy also deemed the award to qualify for “extra-ordinary heroism”. This entire process has brought tremendous relief to Bruce. His life changed in 1969 and once again in 2003. Bruce went on to serve with River Assault Division 131 until late June of 1969. He then was transferred to a Naval Advisory role with MACV Naval Advisory Group ATF-212. Later he moved to ATF 211 and worked with River Assault Interdiction Division (RAID) 72 in the U Minh Forest region with the Vietnamese Marines and Vietnamese Navy.